Access to essential medicines is a serious challenge for many countries in the Asia Pacific region. For this reason, the World Health Organization (WHO) has been working with countries to develop national medicines policies. These policies aim to: (i) support access to high-quality, safe and effective medicines; and (ii) support the rational (or quality use) of those medicines. Throughout the region, countries are in various states of implementation of their strategies, with some countries in the early stages, while other countries have well-developed, fully functional policies. In May 2012, the Asia Pacific Conference on National Medicines Policies was held in Sydney, Australia. Delegates from countries throughout the region shared their knowledge, skills and experiences in implementing their national medicines policies. One subject discussed was how countries are monitoring medicine utilization. Knowledge of the impact of the medicines policy, particularly on access to and use of medicines, is critical to support further development and implementation. In this paper, we describe four different approaches to evaluation of medicines policy implemented by four countries in the region with differing circumstances. The case studies come from Bhutan, a small lower-middle-income country, Indonesia, a large lower-middle-income country, Malaysia, an upper-middle-income country and the Republic of Korea, a high-income country. The countries represent different health systems at different stages in their policy development. Not surprisingly, their methods for monitoring medicine use also vary, ranging from paper-based systems in regional health centres to sophisticated electronic data sets capturing complete populations and held centrally. The lessons learnt from these countries individually and collectively may assist other countries in monitoring medicines use. Bhutan is a small country of 730 000 people with a gross national income per person of $5730 (2011 data; purchasing power parity in international dollars [PPP dollars]). Health expenditure per person is $236.2 (PPP dollars) and life expectancy at birth is 67 years. Bhutan first established an essential drugs policy in 1986, which included a national essential drugs list. By 1987, the national drug policy was in place. The first standard treatment guideline was implemented in 1989 and a national formulary was in place by 1994. Supporting legislation was passed in 2005 and the revised national drug policy developed in 2007. To support implementation of the policy, the Bhutan Government established the Essential Medicines and Technology Division in 2008. The division is responsible for providing systematic, evidenced-based information to the Ministry of Health to support decision-making for new technologies; the assessment of use of medical supplies at all levels of health facilities; and the promotion of rational prescribing, good storage and dispensing practices. To evaluate progress, the division uses a subset of the World Health Indicators for monitoring medicines policy. Drug utilization reports that assess drug consumption and prescribing patterns are collected every 6 months and a monthly prescription survey to assess rational use of medicines is also done. 1 Reports are currently collected from almost half the hospitals and approximately a quarter of the health facilities in Bhutan. Evaluation has shown that almost all medicines prescribed are from the essential drugs list and prescribing by generic name increased to more than 85% in 2012. Approximately 90% of prescriptions also record a diagnosis. Just over 40% of prescriptions include at least one antibiotic, while 4% include injectable drugs and 5% include steroids. Monitoring involves only whether drugs belong to the national essential medicines list and the number of medicines per prescription; more detailed aspects of the use of medicines-e.g., whether they are correctly indicated, given in the correct dose or underutilized - are not monitored. Since the government provides all medicines and the private sector is almost nonexistent outside border towns and the capital city, nonessential medicine use is very low. The same indicators are used for primary care centres and district hospitals. Monitoring in the few referral hospitals in Bhutan is not reported. Some of the challenges with implementation include provision of staff time and training to analyse the reports and motivation of health facilities to complete the reports, particularly when district staff are not able to analyse their own data and when feedback of results is delayed because of human resource constraints. The continuous collection of surveys over time is enabling documentation of improvements in medicine use and early identification of emerging problems. Indonesia is a large lower-middle-income country, with a population of 231 million people and a gross national income per person of $4810 (2012 data; PPP dollars). Health expenditure per person is $126.9 (PPP dollars) and life expectancy at birth is 69 years. The geographical distribution of people across the 13 000 islands that make up the country creates some challenges in medicine management. Indonesia established its national medicines policy in 1983. After sustained implementation and, in particular, a decentralization policy that delegated the authority of health services to local government, the national medicines policy was revised in 2006. In implementing the revised policy, the Ministry of Health paid serious attention to activities supporting rational use of medicine as one of the three main objectives of the national medicines policy. Good progress has been made implementing the rational use of medicines programme, particularly at the primary health-care level, including implementation of educational, regulatory and managerial strategies as well as monitoring medicine use at health centres throughout the country. The monitoring activities involve collection of data by use of the WHO Indicators for National Drug Policies. Data are collected within a sampling frame, which involves two primary health-care facilities within each of two district health offices from each province across the country. There are 33 provinces throughout the country. Data are collected daily by the health centres, using paper-based forms and including 25 cases for each indicator. These data are sent monthly to the district or municipal health office, where the data are compiled and reports sent every 3 months to the provincial health office. These data are further aggregated and sent every 6 months to the Ministry of Health. The final aggregation at the Ministry of Health enables an annual report of the national performance indicators to be produced. This method of data collection enables aggregation of results and yearly indicators to be assessed as well as variation in medicine use by province to be assessed. Results from 27 provinces showed that antimicrobial use reduced between 2010 and 2011 for nonpneumonia upper respiratory tract infections (from 60.02% to 41.36%) and nonspecific diarrhoea (from 62.33% to 36.88%). Longer-term trends will need to be established to draw conclusions about whether this fall in use is sustained. Average number of medicine items per prescription - an indicator of polypharmacy - reduced slightly from 3.59 to 3.47 but the percentage of patients receiving an injection for myalgia was unchanged (3.72% in 2010 and 3.96% in 2011). Barriers to monitoring use include human resource constraints in primary health-care units to collect data. Malaysia is an upper-middle-income country of 29 million people with an estimated gross national income of $15 720 per person (2011 data; PPP dollars). Health expenditure per person is $558.6 (PPP dollars) and life expectancy at birth is 74 years. Malaysia's national medicines policy was first established in 2006. The policy includes core components of the quality, safety and efficacy of medicines, drug availability, drug affordability and quality use of medicines. It also includes supportive components of human resource development, research and development, technical cooperation and management. Malaysia monitors medicine use with a combination of data sources, including the National Pharmacy Services Statistics, National Medicines Use Survey (NMUS) and the National Medicines Price Survey. The National Pharmacy Service Statistics aims to collect data on pharmacy services throughout Malaysia. Monitoring occurs quarterly and is useful for policy-makers to improve pharmacy services. The NMUS is supported by the Ministry of Health and aims to provide information on the use of medicines over time at the institutional, local, regional and national level. The data are used to estimate utilization, provide an overall pattern of prescribing, and enable an assessment of quality. Quality is assessed by comparisons of use with known patient demographics and the known prevalence of clinical conditions. The data are also used to estimate expenditure on pharmaceuticals, to describe price variation and to monitor and evaluate the effect of interventions to improve medicine use. The data used in the NMUS include procurement data from public (hospitals and clinics) and private (hospitals) health institutions, prescription data from private general practitioners, as well as medicines dispensing data from retail pharmacies. Data are not available from import or production data, domestic sales data or household consumption. Thus, the data are limited to prescription-only or pharmacy medicines and a few over-the-counter medicines (such as acetylsalicylic acid) but do not include traditional medicines and dietary supplements. Private medical specialists are also not included, thus prescriptions of highly specialized medicines for particular conditions may be underestimated. A medicine pricing survey is also undertaken to examine costs per prescription and medicines prices for new listed medicines. Data are collected at facility level and are based on a basket of selected essential medicines and take into account both procurement price and availability and price to the patient. Publications resulting include the private sector medicines retail price list and the recommended price list for national essential drugs list. Studies of the use of medicines by Malaysian consumers are now under way, with the first national study undertaken in 2008. Findings showed that 56% of consumers still did not understand the proper use of their medicines, 51% were unaware of their trade name and 56% were not aware of common side-effects. However, 61% realized traditional medicines can have side-effects. Based on these findings, further innovative strategies on effective educational intervention targeting consumers were implemented in order to empower consumers with pertinent information on medicines use. An electronic pharmacy system is now in development and may assist further development of the data collection in the future. Constraints include funding and human resources, both in availability and skilled personnel. While the four countries have very different systems for monitoring medicines use, monitoring medicines use was considered a facilitator of medicines policy development and rational medicines use in all countries. Enablers of success included data collection that was relevant to the needs of the individual and society in each particular country and ownership of the data by decision-makers. One of the constraints observed in all countries, regardless of sophistication of monitoring, was the lack of trained workforce and incentives for data collection. In all countries, collection and management of data requires a diverse skill base and capacity building is required, particularly for validating, analysing and interpreting data, as well as report presentation. Lack of awareness of and support by key decision-makers was identified as a barrier and was reflected in limited budgets for data collection and for training the workforce. To facilitate medicines monitoring, efficient and effective methodologies , should be employed, together with clearly and concisely reported data, timely and frequent reporting and defined roles and responsibilities of all participants. Feedback to stakeholders to facilitate quality use of medicines enables further data collection. Countries or institutions should start with simple but efficient systems and build on small successes and appropriate technology should be used to enhance monitoring. Successful monitoring of medicines use requires local, regional and national level ownership, as well as understanding and use of the data at all levels. The authors gratefully acknowledge the contribution of Dr Nani Sukasediati for her contribution in reviewing this manuscript. 1. World Health Organization Western Pacific Regional Office. Essential Medicines and Pharmaceuticals Policy. Manila: World Health Organization, 2012. 2. World Health Organization Western Pacific Regional Office. Indicators to measure country pharmaceutical situations. Manila: World Health Organization, 2012. 3. APCNMP Organising Committee. Asia Pacific Conference on National Medicines Policies. Brisbane: Expert Events, 2012. 4. World Bank. Bhutan. Available from: http://data.worldbank.org/country/bhutan. [Last accessed on 2013 Oct 24]. 5. Brudon P, Rainhorn JD, Reich MR. Indicators For Monitoring National Drug Policies. 2 nd ed. Geneva: World Health Organization, 1999. 6. Ministry of Health Malaysia. National Medicines Policy of Malaysia. Kuala Lumpur: Ministry of Health Malaysia, 2009. 7. Pharmaceutical Services Division. Malaysian Statistics on Medicines Kuala Lumpur: Ministry of Health Malaysia, 2012. 8. World Health Organization Collaborating Centre for Drug Statistics Methodology. ATC/DDD Index 2012. OSLO: World Health Organization Collaborating Centre for Drug Statistics Methodology, 2011. 9. Australian Government Department of Health and Ageing. 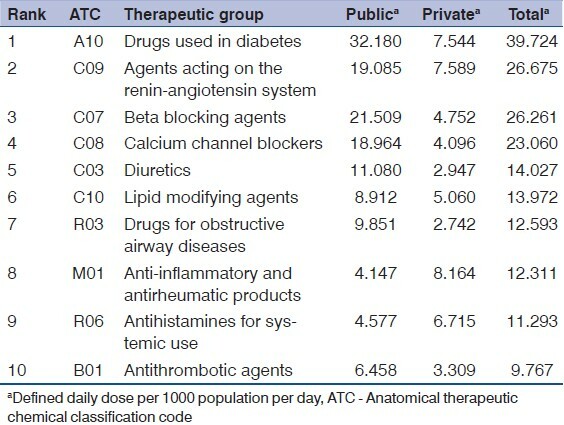 Australian Statistics on Medicines. Canberra: Australian Government, 2012. 10. Babar Z, Ibrahim M, Singh H, Bukhari N. A survey of medicine prices availability, affordability and price components in Malaysia using the WHO/HAI methodology. Amsterdam: Health Action International, 2005. 11. Pharmaceutical Services Division. Medicine Price List. Kuala Lumpur: Ministry of Health Malaysia, 2012. 12. Bahri S, Othman NH, Ahmad Hassali MA, Shafie AA, Mohamed Ibrahim MI. A national survey on the use of medicines by Malaysian consumers. Kuala Lumpur Pharmaceutical Services Division, Ministry of Health 2009. 13. Park BJ, Sung JH, Park KD, Seo SW, Kim SW. Report of the evaluation for validity of discharged diagnoses in Korean Health Insurance database. Seoul, Korea: Seoul National University Press; 2003 (Korean). 14. Seong JM, Choi NK, Jung SY, Chang Y, Kim YJ, Lee J, et al. Thiazolidinedione use in elderly patients with type 2 diabetes: with and without heart failure. 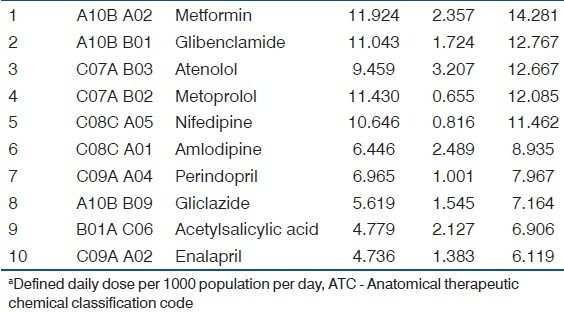 Pharmacoepidemiol Drug Saf 2011;20:344-50. 15. Shin JY, Choi NK, Jung SY, Kim YJ, Seong JM, Park BJ. Overlapping medication associated with healthcare switching among Korean elderly diabetic patients. J Korean Med Sci 2011;26:1461-8. 16. Korea. Ministry of Health and Welfare Notice No 2008-90 and No 2009-28. 17. Choi NK, Hahn S, Park BJ. Increase in mortality rate following coprescription of cisapride and contraindicated drugs. Ann Pharmacother 2007;41:667-73. 18. Management Sciences for Health. MDS-3: Managing Access to Medicines and Health Technologies. Arlington, VA: Management Sciences for Health.